What a CO2 Diffuser will Allow you to have in your Tank? Plants, like all living things, require proper nutrients to thrive. While animals hunt for food, plants depend fully on environment for their basic nutrients for their survival and growth. Photosynthesis, the driving mechanism for plant growth, requires CO2 and light for energy to drive chemical reactions. Besides, various other elements are also required during photosynthesis for creating carbohydrates. Plants store these carbohydrates and use it later for the growth. A specific light energy threshold is required for the process of photosynthesis, which will not occur if the light is not bright enough. Photosynthesis will run faster and faster beyond that threshold. Depending on the types of plants and depth of aquarium, around 2-3 watts per gallon of fluorescent light is recommended. The required light levels cannot be measured accurately by using watts per gallon. But, it is the only reliable measurement available for aquarists. As mentioned earlier, various nutrients are required for photosynthesis. Short supply of even a single nutrient will limit the rate of photosynthesis. A typical aquarium is deficient in both iron (Fe) and CO2 with respect to optimum levels. Lots of trace element products are available in the market for meeting the requirements of iron and other trace elements. 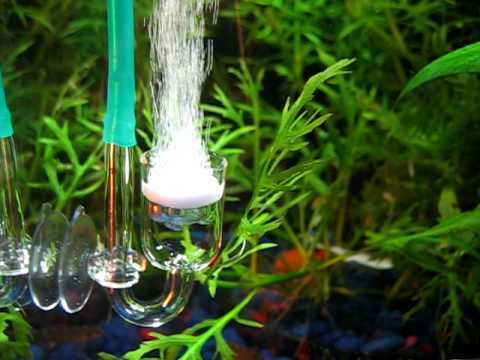 In order to boost the concentration of CO2 in an aquarium, CO2 injection is the best way. Here comes the importance of CO2 diffusers. CO2 Diffuser: Is it Harmful to Fish? CO2, in high concentrations, can block the respiration of CO2 from fish gill. This will cause the starvation of oxygen. A certain level of CO2 exists in all aquariums. Fishes exhale CO2 through the process of respiration. However, this is not enough for the other living things in an aquarium. If you want to attain a certain level of lush plant growth, you have to add CO2 mechanically to the planted aquarium. You are aware that plants require an environment with certain concentration of dissolved CO2. This level is around 10 to 15 ppm (part per million). You should strictly keep this value as constant as possible. A high amount of dissolved CO2 can harm your fishes and other invertebrates that live in your aquarium. If you are able to keep it below 30ppm, you will be on the safer side. Depletion of CO2 can cause various problems in your planted aquarium. Paling in the stems and leaves, and stunted growth of plants are the most notable problems. If the level of CO2 remains low for long, it will lead to the death of plants in your tank. Aquarium plants also start getting lime deposits on their leaves. Moreover, dissolved carbon dioxide (CO2) becomes carbonic acid in water. As a result, the depleted levels of pH of your tank will increase, which creates serious consequences for plants and fishes in your aquarium. Both plants and fishes will have increased susceptibility to diseases in rising high pH levels. Besides, you can also expect the algal growth due to increasingly low CO2 levels. It will cause lots of other problems, which include ammonia poisoning. In order to inject CO2 in a planted aquarium, a wide range of CO2 equipment are available in almost all aquarium stores. People are using these products for their planted aquariums. You can supplement carbon dioxide in your tank in a number of ways. Gas or liquid injection is most famous among them. You can administer carbon (in gaseous form) in three ways, pressurized system, yeast based and aerosol. The third one is the cheaper CO2 alternative and it is useful for smaller tanks. Yeast based is the most uncontrollable and inefficient way of getting CO2 into a planted aquarium. Pressurized CO2 systems are considered as the easiest and best option to deliver adequate level of CO2 in your planted aquarium. These are reliable and consistent, but these systems are more expensive. However, you will get the best CO2 diffuser at an affordable cost at CO2Art.